The crafts and activities from this lesson are available on The Resource Room. In this lesson the teacher takes her students on a picnic. When they arrive they find that Arnie Ant has eaten most their lunch. 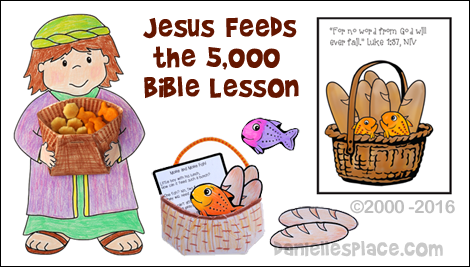 This reminds the teacher of the story of Jesus feeding the 5,000. After the story the teacher discovers that the food wasn't eaten after all. 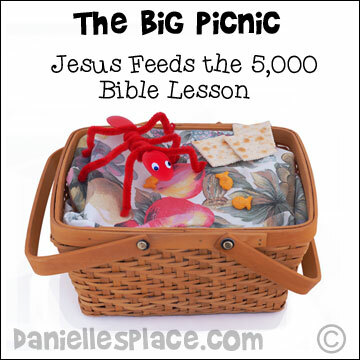 It was just hidden under a cloth in the basket so the children enjoy a picnic with Arnie Ant and image how the people felt when Jesus prayed and everyone had enough to eat when there was only two fish and five loaves of bread. This craft can be made with a invitation envelope or by using the printable pattern available with the lesson. 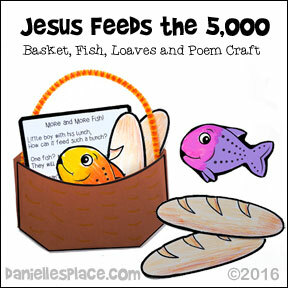 Patterns for the fish, poem card, and loaves are available to members and as an instant download with the Bible lesson above. 1. Before class make a sample craft. Cut the top flap off of the envelope. 2. Draw a curved line around the front, top edge of the envelope and then draw a mirror image of the curve on top of the first curve. Use a pencil so you can erase in case you don't get it quite right the first time. 3. Fold back the bottom two corners of the envelope as shown in the diagram and tape them back. 4. In class have your children color the envelope to look like a basket. 6. 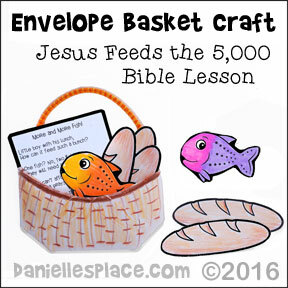 Have your children place fish and bread loaf pictures in the envelope basket. You can also use fish crackers and other crackers to represent the bread. This craft also comes with a printable envelop basket pattern. Little boy with his lunch, How can it feed such a bunch? One fish? No, two fish! They will need a lot more fish! 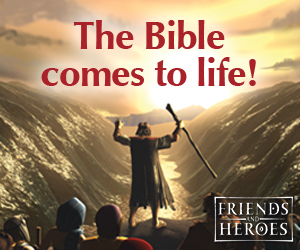 They can’t afford to feed the horde so Jesus prays to the Lord. And God gives them what they wish! Lots of bread and more and more fish! This craft is made basically the same way except the pattern is printed and cut out. Watch a video on how to make this craft. 1. 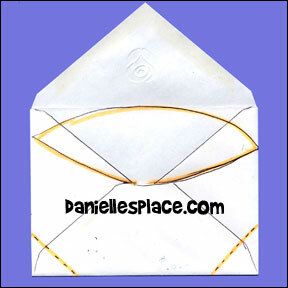 Watch a Video on how to make this envelope craft on Youtube.com. 3. Fold the pattern in half one way, unfold and fold it in half again the opposite way. 4. Fold the side tabs back. Fold the corners back and then forward and crease the folds. 5. Unfold the envelope and press in on the two corners so that they fold inward. 6. Place glue on the inside of the corners and on the tabs to glue the envelope together. 7. Place glue on the ends of the Chenille stem and place it in the envelope for a handle. A pattern for this craft is available to members on The Resource Room and as an Instant Download above. 1. Before class print out the picture of the little boy and the hand patterns onto card stock. Cut out the hand patterns. 2. In class have your children color the picture and the hands. 3. To make the baskets fold snack-sized paper plates into thirds making a cone shape. Fold up the bottom pointed end of the cone three inches from the bottom, and then fold down the end so that it is inside the cone shape making the basket shape. 4. Glue the basket to the front of the boy picture and then glue the hands to the basket and the picture. 5. Have your children fill the baskets with fish crackers and oyster crackers, and use their craft to retell the story in their own words. 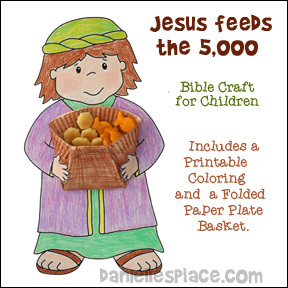 Children can make "Arnie Ant" holding a sign that says, "Jesus uses little things to do big things." 1. Before class print out the ant patterns onto card stock. Each ant has a top and bottom pattern. 2. Color the top and bottom patterns and then cut them out. 4. 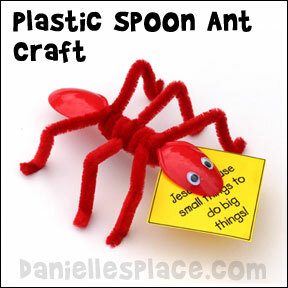 Stick the half pipe cleaners through one hole on the side of the ant's body and bring it under the body to the corresponding hole on the other side of the ant's body. Tape the pipe cleaners down between the holes. 6. Use the other half pipe cleaner for the antennas. Glue the two patterns together so that the pipe cleaners going across the pattern are on the inside. Don't glue the mouth closed. 7. Glue wiggly eyes on the face. 8. 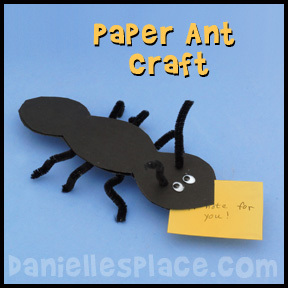 As your children read about ants have them write words on sticky notes that they do not know and place them in the ant's mouth. Older children can write facts about ants on the sticky notes. 1. To make the middle part of the ant thicker you can use the handle of the spoon you cut in half. Cut the handle to fit in the middle of the ant and glue it on. 2. Cut the cupped end of one spoon off leaving a short neck. Glue the cupped part onto the end of another spoon so that the end of that spoon is in the middle of the cupped part as shown in the diagram. 3. 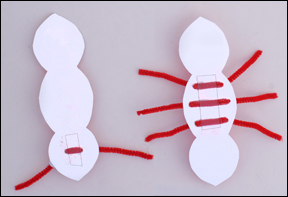 Use three pipe cleaners to make the legs winding them around the middle of the ant. Then wind another pipe cleaner in between the legs to make the middle part thicker. 4. To finish glue on googly eyes. Children make their own baskets of fish and loaves to go along with the Sunday school lesson. Children color the baskets and then glue them together. Have them place napkins in their baskets and then give them giant gold fish crackers and five soda crackers to represent the fish and loaves. 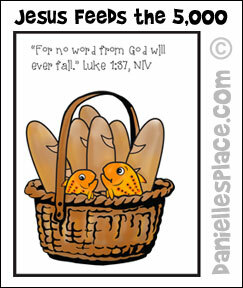 You can also have your children place their Bible verse cards in their baskets. 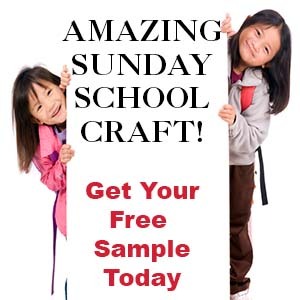 This craft is available to members only on The Resource Room and as an instant download above. 1. 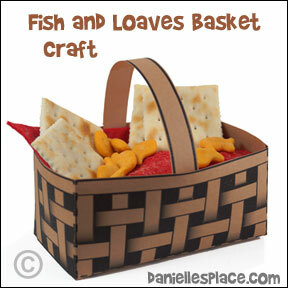 Before class prepare two "Fish and Loaves in a Basket" crafts (above). 3. Place about six ants in each basket with the loaves and fish. 4. In class divide the children up into two teams. Take turns asking the teams questions from the story. 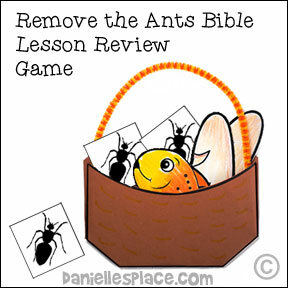 If a team answers correctly, the children can remove an ant from their team's basket. The team that removes all the ants first wins. After watching this video ask your children what they can give to God. Sunny Puppets Plush Red Ant Hand Puppet - 12"